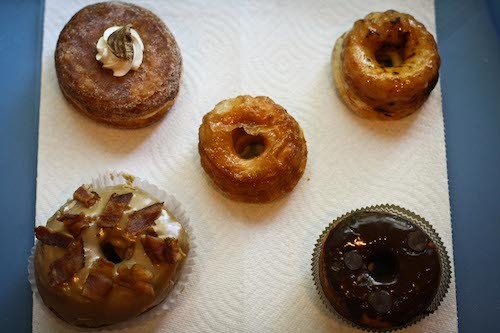 Are Cronuts Dead? Not in LA! While in New York City last week, I debated whether waiting in a two-hour line at Dominique Ansel’s Bakery for those infuriating Cronuts was worth my time. I ultimately decided it wasn’t. Here’s why: last Saturday, I had already sampled six of LA’s best, buttery, gut-bomb knock-offs and quite literally, had my fill. Yes, I sampled them all in one day. Yes, by myself. 1. 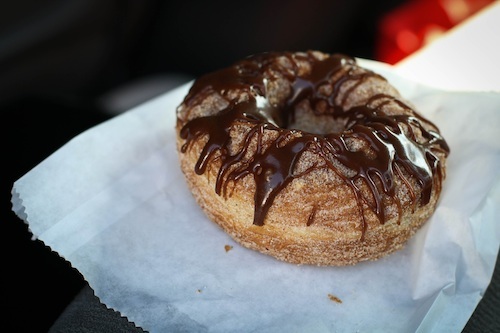 Cronuts (and their imitators) are NOT dead. They are still alive, and folks are still seeking them out in droves. As much as we’re all sick of hearing about them (and shockingly, many folks still have not heard of them) apparently the general populous is still more than willing to stand in epic, Twilight premier-like lines for them. 2. Even a subpar Cronut knock-off is freaking delicious. I’m sorry, there’s nothing I can say to change this fact. 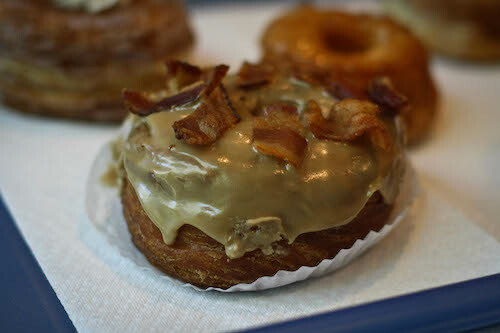 Even the “worst” one I tried was still a really damn good donut. It appears the combination of croissant and donut (and future pastry amalgamations) is so basically appealing, it might be the new fro-yo. And yes, I meant to say it like that. 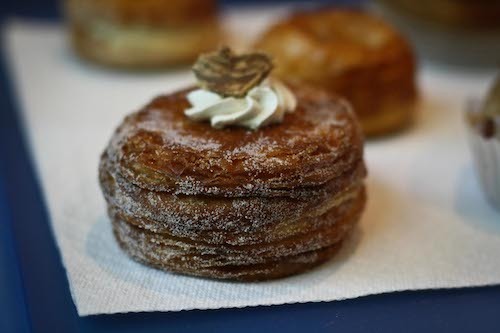 Dominique Ansel trademarked the name Cronut back in May 2013 (it seems like years ago, doesn’t it?) and yet, for us Angelinos, we must make do with its dozens of devilish doppelgängers. I started my (faux) Cronut Crawl rather early in the day, but each store was already inundated with Cronut-seeking customers, happy to pay almost double the price of the regular donuts sitting right next to them. 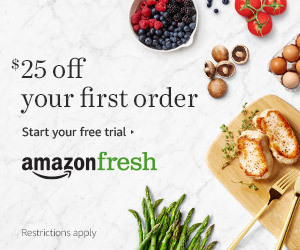 Each bakery and donut shops was making a killing off the hungry denizens coming to try each version of this omnipresent food trend. I grew paranoid they might run out. While a few establishments had come up with a punny name for the sugary mashup, others just called their creation “Croissant Donuts.” No one’s in the mood for a lawsuit, I suppose. This one tasted the most like a regular donut. Albeit, slightly lighter and flakier (and still awesome) but definitely missing the point. That didn’t stop me from devouring every bite. 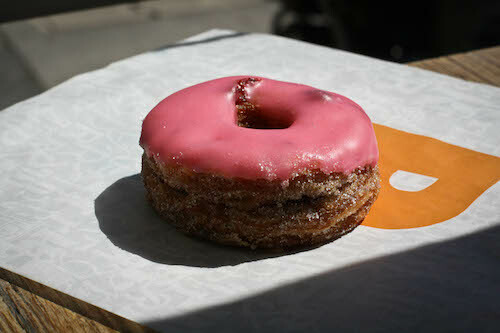 This was one of the prettier ones but certainly proves the old adage “Don’t judge a donut by its pink glaze.” It was a bit tough to chew and the raspberry filling was tasty but kept squirting out in an obscene fashion. This old-school donut shop near the Grove served very solid Cronut attempts. I tried the peanut butter filled, but I would definitely go back and try them all. Layers of flakey croissant dough, lovely filling, cholesterol spiking. Everything you’d expect. Very similar attempt as SD’s but a little more simplistic take. 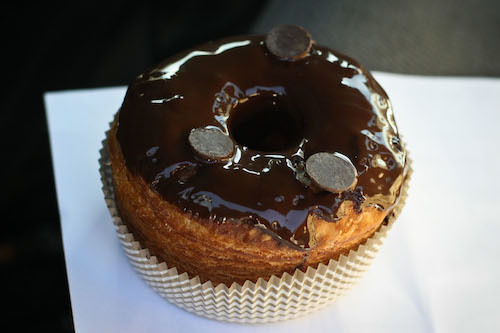 I really enjoyed the chocolate ganache and the layers of croissant but did not enjoy the folks ahead of me who were quickly buying every cronut they could get their hands on. I feared a fight would be in my future. 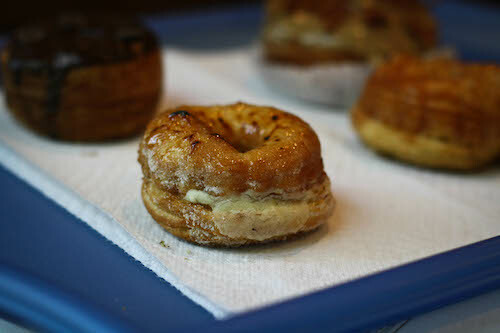 Kettle Glazed is a brand new donut fusion shop and its cinnamon-sugar, custard filled cronut was super moist, super croissant-y, and super delish. The Crème Brûlée “Crullant” is most definitely my favorite. Extremely dense, as if deep fried in melted butter, this heavenly pastry was so packed with flavor I sometimes contemplate playing hooky from work to make the trek for another one. FYI, this daydream occurs daily.